While 2018 was a challenging year for most investors, our Cabot Options Trader Pro members grabbed a 398% profit in CSCO Calls, a 296% profit in ETSY Calls, a 238% profit in FCAU Calls, a 363% profit in AAXN Calls, a 309% gain in IQ Calls, a 244% profit in NTNX Calls and a 123% gain in UNP Bull Call Spreads and many more! That’s the power that options trading gives you—quick gains in a matter of days. No matter how news driven the market is, or whether it’s hitting new highs or is heading lower, trading options is a great way to not only outperform the market, but also to do it with less risk. You just need to know which trades to make and when is the best time to take profits. And that’s where our options guru, Jacob Mintz, comes in. As a successful options trader for 20 years, Jacob has helped many readers double their money in a short period of time under various market conditions. Using his proprietary options scanner, which scans the market all day looking for unusual option activity, Jacob identifies trades that are on target to bring investors double and triple-digit returns in the matter of days. That’s how our readers were able to grab a quick 398% profit in CSCO Calls, a 296% profit in FCAU Calls, a 123% profit in UNP Bull Call Spread this year. He has been able to select the best trades to deliver quick profits to our Options traders for nine years. Jacob Mintz uses trades that range from straight call/put purchases and buy-writes to more sophisticated strategies such as iron condors to guide investors to quick profits while controlling risk. 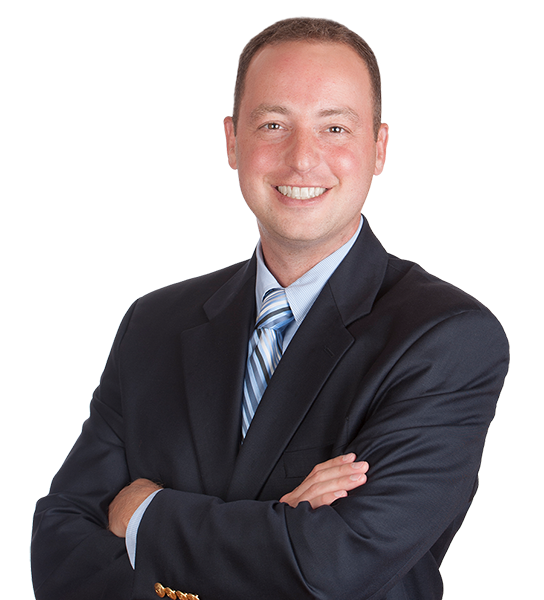 Before joining Cabot, Jacob was an options trader on the Chicago Board of Options Exchange for over 10 years. Using his proprietary options scans, Jacob creates and manages positions in equities based on risk/reward and volatility expectations. Time sensitive trades—options trades that would require the stock to make a BIG move in a short amount of time. Unusual Options Contract Volumes—a sure clue that a big trader is amassing a big position, expecting the stock to move. Repeated Buyers—one of the greatest signals to finding out which are the most desirable trades on Wall Street. Thanks to this proven system we were able to grab many double and triple-digit winners and double our reader’s money multiple times. Trade Options For Quick Profits! Take our trade of Cisco (CSCO) for example. After seeing unusual call activity in CSCO from an institutional trader, Jacob recommended Cabot Options Trader Pro subscribers buy a Call position in a stock which resulted in a 398% gain in 120 days. Or take Jacob’s closed position in Etsy (ETSY). After seeing unusual call activity in ETSY from institutional traders, Jacob recommended Cabot Options Trader Pro subscribers execute a Bull Call Spread that resulted in a 296% profit in just 90 days! Similarly, a position in a Fiat Chrysler Automobiles (FCAU) call bought on January 3 resulted in a 238% gain in just 2 weeks! Trading options has never been easier, thanks to the step-by-step instructions (and education) on how to execute each trade from Jacob. 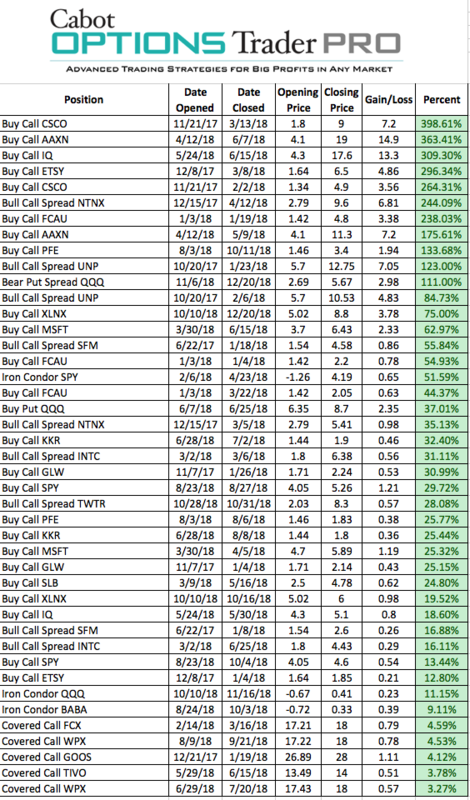 Thanks to our proprietary options trading system our readers were able to grab gains like these: a 244% gain in a SYMC Call Spread, a 173% gain in a BUD Bull Call Spread and a 128% gain in a Visa Bull Call Spread, just to name a few. While you can’t go back and grab those profits, it’s not too late for you to start profiting from our advice. We’ll show you how you can make the most money by using the strategies that have been proven to bring the most profitable results. We are living in an environment where it is virtually impossible to get yield in the traditional manner. The Federal Reserve has driven interest rates so low that traditional bank CDs or money market account returns are virtually zero. So how do we create yield in such an environment? One strategy that all investors can use is options trading. There are countless ways to use options to create yield. Covered calls should be in every investor’s playbook. And writing puts is a tremendous strategy to enter a stock at a good price and create yield. In just a matter of days, you can grab modest profits and boost your portfolio returns just like the quick 238% gain we made in a FCAU Calls in just 16 days, another 55% gain in a FCAU Calls in one day, a 31% gain in a INTC Bull Call Spread in just 4 days, a 36% gain in a CSCO Calls in just seven days or a quick 26% gain in a V Bull Call Spread in just eight days. In addition, options are a great way to protect gains in anyone’s portfolio. Jacob developed his proprietary risk management system during his years as an options market maker at a top tier options trading company in Chicago. And when he detects large put buying in the indexes or in leading stocks, he buys puts to short the market, like he did in August of last year when he bought SPY Puts and made a 36% profit. One of Jacob’s most successful strategy’s throughout his 19-year options trading career has been using his unusual-option-activity scanner. When his proprietary options screener alerts him to a trader buying thousands of calls and risking many millions of dollars, his alarm bells go off. These aggressive repeat buyers are a favorite tool for sophisticated hedge funds and are just about the most bullish trade you can execute using options. Join Cabot Options Trader Pro, and Trade Options Like the Experts. 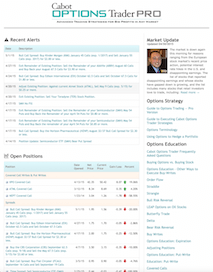 Click the button below to claim your FREE Reports when you subscribe to Cabot Options Trader Pro. As a Cabot Options Trader Pro subscriber, you’ll receive trade alerts that are identical to how Jacob trades in his personal account, and how he has traded since he ran a trading crowd on the floor of the Chicago Board of Options Exchange. With nearly seven years under our belt now, the results have been simply phenomenal—doubling our readers’ money 19 times while delivering 135 double- and triple-digit winners. Not by making daily trades, but by making disciplined and tactical ones where the percentages of success are in our favor. Whenever Jacob determines the time is right, he sends specific option buy and sell alerts via email and text-message for immediate action. He also sends out a weekly update with his views on the options market, open option positions and his outlook for the coming week. ✓ Daily alerts from Jacob where he points out the profit opportunities in the market and keeps you up to date with what’s happening with all the open positions. ✓ Flash Alerts to open or close a position to ensure you can pull the maximum profit out of each and every trade. ✓ Access to our private Cabot Options Trader Pro website which includes the archive of all of our recommendations. ✓ Ability to email the analyst with questions anytime. ✓ Free bonus reports Guide to Options Trading and Guide to Executing Cabot Options Trader Strategies explaining how options limit risk and provide leverage and profit in any market. ✓ A continuing education series designed to help you become a better trader and make the most profits from every trade. ✓ A free subscription to Cabot Wealth Daily, our email advisory that features investing advice, tips and stock recommendations from Cabot analysts. Finding a winning options trading advisory is not at all easy. Finding an affordable options trading advisory is even harder. Knowing that, I’ve made it possible for you to join us today for an affordable price of less than $6 a day. Not only will you join at our best price ever, you’ll also have 30 days to decide if Cabot Options Trader Pro is right for you. This way, you’ll get a chance to get the best options trades and advanced options education available at a great price. With Cabot’s 30 days satisfaction guarantee, you have nothing to lose. Don’t wait. Start benefiting from options trading today. With our 30 days money-back guarantee you have nothing to lose and everything to gain. Editor’s note: In order to do some of the advanced options trades, you may need to have special qualifications that vary by broker. You should contact yours to find out if you are eligible to do intermediate to advanced options trades.